It's a question that many of Dr. Heather Evans’ patients grapple with. Some have emailed photographs of their incision sites to Evans, a UW Medicine surgeon. picture of UW Medicine surgeon Heather Evans. 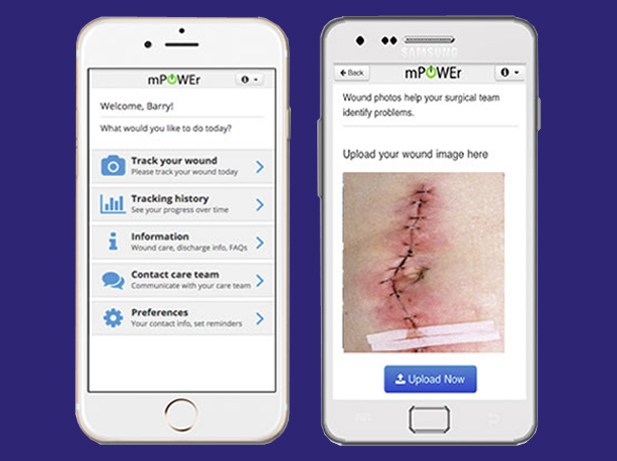 That concern led to the development of mPOWEr, a web application that enables patients to share photos, symptoms and concerns directly with healthcare providers over a mobile phone or computer. mPOWEr stands for Mobile Post-Operative Wound Evaluator. With it providers can securely monitor patients’ wounds and communicate directly. Up to 3 percent of surgery patients’ incision sites become infected; many of those infections emerge during the first two weeks post-op. Evans thought there had to be a better way to communicate with patients after they leave the hospital. She started asking surgical patients about their post-op experiences. “They told horrifying stories of being told to go back to the emergency room because no one could diagnose their wound infection over the phone,” Evans said. “A lot of these people don’t live close to the hospital, and it is a big burden for them to get to the ER.” In 2013, Evans began pursuing the idea for mPOWEr with a team of collaborators, first doing market research to establish the app’s prospective value, then building the software. In October 2015, patients at the UW Medical Center's Reconstructive Clinic began piloting mPOWEr. Response from patients and providers has been positive, though less tech-savvy people have expressed anxiety about using the app. Some caregivers have expressed concern about empowering patients to send information “that doctors must act upon,” Evans said. mPOWEr is part of a growing trend in healthcare. Smartphone users now have more than 165,000 healthcare apps to choose from, according to a 2015 report from the IMS Institute for Healthcare Informatics. “Patients are coming to us saying, ‘Why can’t I use my phone? I can use it to bank, shop, communicate with everyone else in my life. Why can’t I use it to communicate with my provider?’ A lot of this is driven by the patient,” Evans said. Evans and her team will soon be assisted by funding from a $30 million federal grant. When the mPOWEr pilot ends at the reconstructive clinic, she hopes to bring the app to patients who have undergone post-mastectomy breast reconstruction and those recovering from colorectal and other abdominal surgeries.